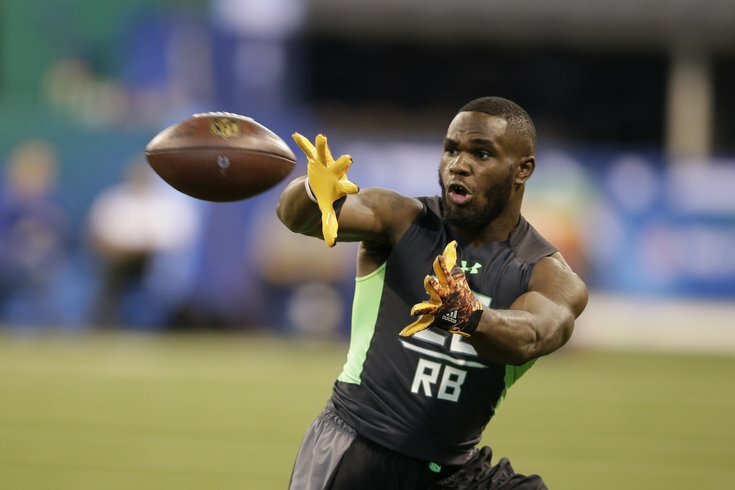 During the pre-draft process, RB Wendell Smallwood impressed the Eagles with his ability to catch the football. Leading up to training camp, as we did last year, we'll be comparing each of the Eagles' rookies to current NFL players. We started it off with No. 2 overall pick Carson Wentz, followed by third-round offensive lineman Isaac Seumalo. Today, we'll find a comp for fifth-round pick (153rd overall) Wendell Smallwood. Smallwood and Johnson have very similar body types on paper, but Smallwood is a little faster, according to their 10- and 40-yard dash times. However, where Smallwood and Johnson are most similar is in the passing game. In 2015 for West Virginia, Smallwood had 26 catches for 160 yards (a low 6.2 YPC average), and a long reception of just 15 yards. Over his college career, he didn't have a single receiving touchdown. However, after watching Smallwood in practice at OTAs and minicamp, it was very clear why the Eagles like him – he can catch the football. "I really like the fact how he catches the football out of the backfield," said Doug Pederson back in May. "I think that is something that is just a gift that he has. He's a natural, a natural pass catcher." At West Virginia, as we showed in a film breakdown of Smallwood's game, the Mountaineers didn't take advantage of Smallwood's receiving abilities, at least during his final season there. On pass plays, they would often simply send him out into the flat as a safety valve, and little more. Smallwood explained, "I didn't get to do it a lot this past year, but in my sophomore year, (West Virginia coach Dana Holgorsen) said I was the best slot receiver we had. If I wasn't in at running back, I would have definitely been in the slot ... My junior year, he needed me to run the ball, so I didn't get to do it a lot." In his first year in the NFL, Duke Johnson racked up 61 catches for 534 yards and two receiving touchdowns, although he didn't carry the ball all that much. As a runner, he only had 104 carries for 379 yards (3.6 YPC) and no TDs. I believe Smallwood will have a similar pass-catching role in the Eagles' offense that Johnson has in Cleveland. From an Eagles comparative perspective, Smallwood has some similarities to Wilbert Montgomery, who was also an accomplished pass catcher in a smaller body, at 5'10, 195.